I made this card for my 21st anniversary back in October but never had time to post it so I thought I would close 2011 with a little luck. 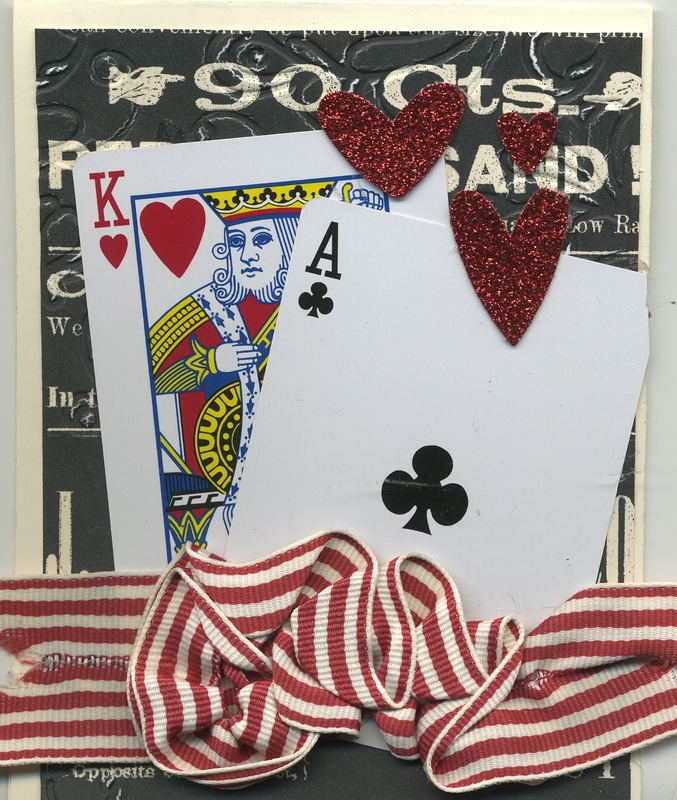 This card uses 2 cards from a standard deck of playing cards and a piece of 1 1/4inch striped grossgrain ribbon scrunched up and mounted on a piece of black and white DSP to create a whimsical card. I have to say good-bye to 2011 but look forward to 2012. Cheers! 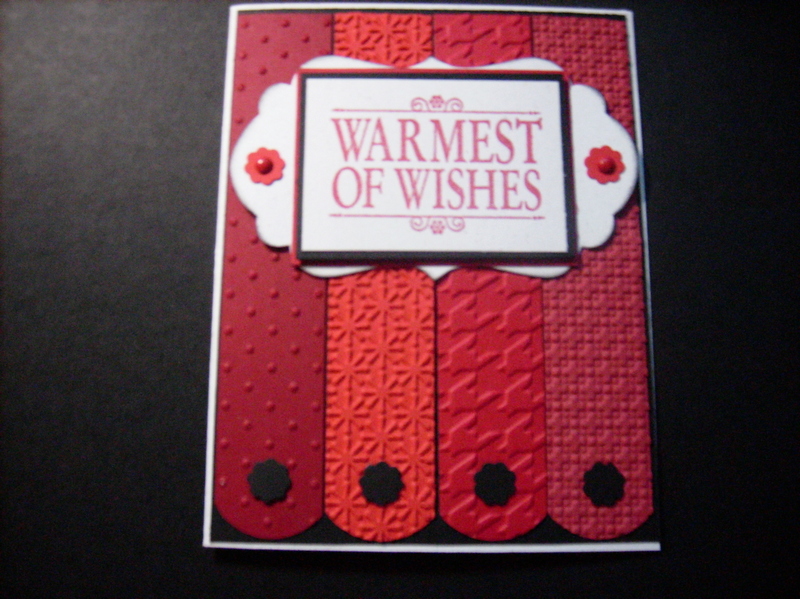 This monochromatic card was created by Yvonne Crook using various shades of red and different embossing folders. Great job and how easy to change the color scheme for a whole different look. These cards are a few of the ones that I made last minute when I had to make 8 cards for those not on my original 150 card list. They were super cute and super quick.
. This will be the last Christmas post until my Christmas in July 2012 workshop. I had a ball this year using the santa suit as a theme for my decorations and gift wrap. I made these 2 adorable santa holders for gifts. The first one is using the new petite pocket die #123131 and red cardstock to hold a single serve coffer and the cutest starbucks keychain gift card. The second one is a 3D box made from 2 modified milk carton dies #117310 and embellished with the scallop ribbon border punch and silver glimmer paper and black cardstock for the belt. Cute I must say. I sent out an inital 150 handmade cards and then had to send out 8 additional to new people that have never been on my list before so that is 158 hand made cards this holiday season. 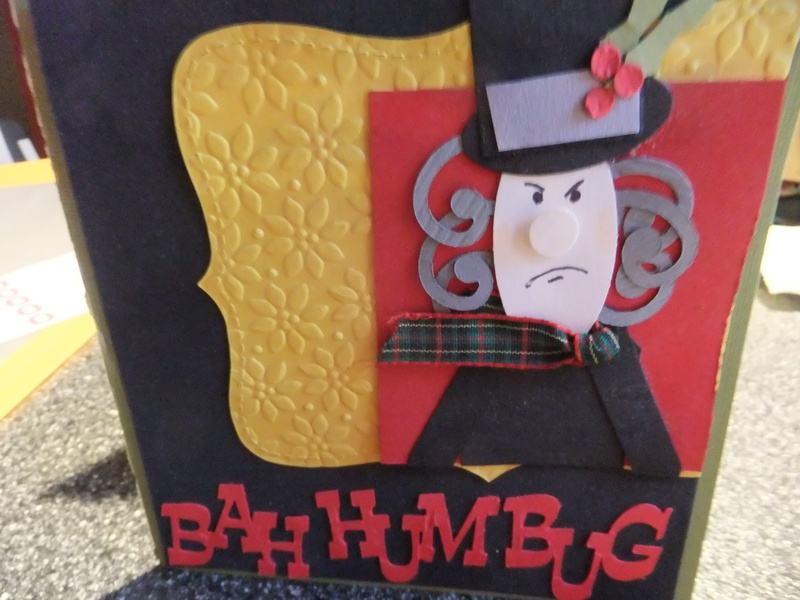 In return, I received 12 handmade cards (as seen in this post), 40 photo cards and 36 standard Christmas cards and 2 Christmas letters – a 55% return. As I say every year, I am going to remake my list and check it twice next year and skip the handmade card and switch to the photocards with no personal note or handwriting at all, addressed with the avery label and a return address label and a self sticking stamp… this time I am serious I really like the simplicity of the photo cards and I will limit my handmade cards to 2 dozen. Stay tuned. Need I say more? Today’s post is an ode to all the hype we put up with in anticipation of the holidays and how we all feel the day after. I will wait until the crowds die down to do my returns. I stayed in and started cleaning out closets to make room for all our new stuff.